Books | Searching for the Real Jesus in an Age of Controversey | Watchman Fellowship, Inc. Contents: 374 pages, notes, index. "It doesn't really matter what else you believe, as long as you believe in Jesus." That refrain is repeated worldwide by Christians as well as non-Christians, but what most people forget to consider is which Jesus you believe in. 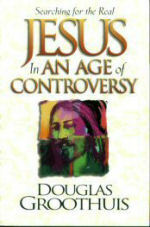 In this carefully researched and written book, you will meet most of the contemporary Jesus imposters (the new age Christ, the stand-up Jewish comedian of the Jesus Semiar, the gnostic Christ, etc.). More importantly, you will discover the wealth of evidence, documentation, and argumentation for the real Jesus -- the God-Man who came to die for our sins and who rose to give us life.